Washington D.C.–According to Jack Gillis’ latest report, there are 70 million vehicles on the road with open recalls. I know I’ve heard many people say they don’t bother to take their vehicle to the dealer when receiving a notice. Of course, it is voluntary, but if it’s at no expense to the owner, why wouldn’t you? In the last 10 years, Gillis reports, over 280 million vehicles have been recalled – more than the 270 million vehicles currently on the road. With recall completion rates in the 70-75% level[i] that leaves over 70 million vehicles on the road with open recalls. With 70 million vehicles driving around with open recalls it poses a large highway safety danger. “While these open recalls present a clear hazard to the occupants of these vehicles, they are also a hazard to the rest of the driving public,” said Jack Gillis, CFA’s Executive Director and author of The Car Book. The result: a significant number of used vehicles are likely to be sold with open recalls. While the subsequent owner can have any recall addressed at no charge for 15 years from when the recall was issued, they may not know about the recalls or fail to check their particular vehicle. They may also experience lengthy delays in being able to obtain repairs, due to severe shortages of repair parts, or the manufacturer’s failure to provide a remedy. One of the government’s most important auto safety functions, notes Gillis, the automobile recall program can be fully effective only if recall completion rates are dramatically increased. “It’s simply not enough to announce a recall, the car companies, car dealers, and government must do everything possible to remedy those recalls,” said Gillis. “Under federal law, car dealers can’t sell new cars with open recalls, and under state laws, car dealers are not allowed to sell recalled used cars either. But those laws are not being adequately enforced. With today’s communication technology, social media, and information databases, there is no excuse not to significantly increase compliance with safety recalls,” added Gillis. The entire auto industry, all levels of government, and individual consumers each have an important role to play in ensuring that safety recalls are performed, maintains Gills. The huge rental car industry must acknowledge and respect the importance of recalls, so too should the rest of the automotive use and retail industry. 1. State attorneys general should enforce existing state laws that prohibit car dealers from knowingly, negligently, or deceptively selling unrepaired recalled used cars. 2. In addition, Congress and the President should enact federal legislation, enforceable by NHTSA, to prohibit car dealers from selling recalled used cars. 3. Require fleet operators to remedy open recalls upon notice and prior to returning vehicles to service. 4. Recalled taxis and ride service vehicles must be remedied upon notice and prior to returning vehicles to service. 5. Auto auction companies must remedy recalls during their refurbishing process and prior to the transfer of the vehicle. 6. Require car companies to send out notices (by e- and postal mail) every two months until the recall is resolved or vehicle has been removed from service. 7. Require DMVs and state inspection programs to include VIN-specific recall notices on registration renewals and inspections to alert the owners that their vehicles have unrepaired recalls. 8. The government (NHTSA) must initiate an effective public education campaign to get vehicle owners to sign up for recall notifications. 9. New and used car dealers must register owners for recall notices on safercar.gov as part of the selling paperwork. Insurance companies should provide a recall report before providing insurance. 10. Manufacturers must provide loaner cars for owners of recalled vehicles when there are significant delays in obtaining recall repair parts. Mary T. Barra, chairman and chief executive of General Motors Company, accepted the Yale Chief Executive Leadership Institute’s Legend in Leadership Award on September 24 at a ceremony at the Yale CEO Caucus in Washington, D.C. The award was to chairman Barra, among other leaders on Monday presented to Barra by Caucus organizer Jeffrey Sonnenfeld, senior associate dean for leadership studies at the Yale School of Management. He commented, “Mary Barra has GM in her DNA. She worked in GM for 33 years—starting as an 18-year-old co-op student working on the factory floor—before being named CEO in 2013. Her father worked for GM for almost 40 years as a tool-and-die maker, and Mary went to college at what was then called the General Motors Institute. She held a series of manufacturing, engineering, and senior staff positions, including plant manager, global HR, and global manufacturing engineer. In the aftermath of GM’s 2009 bankruptcy, she led the revitalization of GM’s product development process, resulting in the launch of celebrated new products, the delivery of record product quality ratings, and a dramatic improvement in customer satisfaction. There can’t possibly be anyone who doesn’t like a hot dog now and then. And for those who really, really like hotdogs, here is a trivia quiz to test your knowledge about one of American’s favorite foods. As you’ll soon learn from the following trivia answers, hot dogs are well-loved. It’s estimated Americans consume 20 billion hot dogs a year. That’s enough wieners to reach to the moon and back four times. Even Babe Ruth, the great ball player, ate 12 hot dogs between games, of a scheduled double-header, chased by eight bottles of pop. 2) In how many movies has the Wienermobile co-starred? 3) What did New York Polo Grounds hawkers call ‘hot dogs’? 4) Who wrote the wiener jingle for Oscar Mayer? 5) What city’s citizens prefer their hot dogs topped with sauerkraut and swiss cheese? 6) Where and when did the first Wiernermobile cruise the streets? 7) How much did Wiener Whistles cost at the 1965 New York World’s Fair? 8) What was the chef’s name who handed out Wiener Whistles to children from his Wienermobile? 9) Who took a Wienermobile for a test lap at the 1988 Indy 500? 10) Where and when were hot dogs first served in buns? 12) Where was the first hot dog created? 13) Which three presidents served hot dogs at an official White House function? 14) How many hot dogs will Americans eat in major league ball parks during a season? 15) How many hot dogs will Americans eat between Memorial Day and Labor Day? 16) What were some of the vanity plates used on the Wienermobile? 17) What are the Wienermobile drivers called? 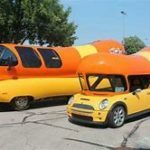 A big part of promoting the hot dog is the traveling Wienermobile. By logging on to Kraft Foods web site, you can find out just where the Wienermobile can be seen. Each year the Wienermobile travels about 1,000 miles per week, or about 50,000 miles per year. If you’re lucky enough to spy it cruising the neighborhood, be sure and get on board. In 2004, the updated Wienermobile included voice-activated GPS navigation audio center with wireless microphone, a horn that plays the wiener jingle in 21 different genres from Cajun to Rap to Bossa Nova! Of course, it includes better gas mileage! 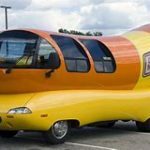 Over the years, the Wienermobile’s chassis was a Dodge, and during the 1950s, a Willys Jeep chassis. 2) Two “Ladybugs” starring Rodney Dangerfield, and “Another You,” starring Richard Pryer and Gene Wilder. 3) Dachshund sausages, renowned sports cartoonist Tad Dorgan couldn’t spell dachshund so he wrote ‘hot dog.’ The name stuck. 4) Richard Trentlage in 1953. 7) Two cents, and they were sold in vending machines. 9) Al Unser, Jr., topped off at a speed of 110 mph. 10) 1904 St. Louis Exposition-the concessionaire had been giving customers white gloves to protect their hands from the steaming wieners, but they kept disappearing. 11) The Berlin Symphony Orchestra-as well as a teenage rock band, a string ensemble and a Nashville country western group. 13) Franklin D. Roosevelt in 1939. Jimmy Carter in 1977 and Ronald Reagan in 1980. 14) Hotdog and sausage consumption at major league ball parks in the U.S. in 2016 was 19.4 million; the most at San Francisco Giants park (475,000), followed by St. Louis Cardinals (400,000), Boston Red Sox (377,00). 15) More than 7 billion-enough to circle the globe 15 times. And, 2 billion in July, National Hot Dog Month. 16) Yummy, Our dog, big bun, lil link, oh I wish, weenr, wnrmble, bologna, relshme, oscrmyr. 17) “Hotdoggers.” And they hand out toy wiener whistles! Entrepreneurship was once an opportunity accessible only to men. With the exception of a few brave women who defied the odds, most females historically failed to break through the barriers of the male-dominated business space. However, it is the 21st century, and it is becoming an era in which women are a powerful force in society, especially in our economy. It is not only common for women to be entrepreneurs today, but it also means they are becoming part of an influential group. According to an American Express OPEN-commissioned report, more than 9.4 million women-owned businesses currently operate in the U.S. Combined, those firms account for nearly a third of all privately held companies, pull in annual revenues to the tune of $1.5 trillion and provide jobs to roughly eight million workers. Women-owned businesses are among the fastest-growing enterprises in the nation, increasing at a rate 1.5 times the U.S. average and topping “the growth rates of all but the largest, publicly-traded firms” in the past 18 years. If you are inspired to become the next Madam C.J. Walker or Jessica Alba, two women known for their epic entrepreneurial achievements, you might want to consider where to begin your future endeavor. Location plays a key role in the success of any business; particularly, a woman-owned business. It’s true that some areas are better than others at encouraging female entrepreneurship and recognizing its value. To determine where best to begin your entrepreneurial endeavor, WalletHub’s analysts compared the 100 largest metropolitan statistical areas, (MSAs), across 10 key metrics indicating friendliness toward this group. Their data set ranges from average revenue growth of women-owned businesses to presence of women’s business centers to industry variety for women-owned firms. Girls Auto Clinic is ready to ‘ratchet up’ locations nationwide! Patrice Banks, of #sheCANic fame has been hinting she has some exciting news to announce. She hopes you’ll be as excited as she is. I know we are, having watched her progress. Who says ‘girls’ don’t want to know more about cars? We’ve known this for some time. Banks is so excited to announce that she is launching a crowdfund campaign on August 15th to grow the #sheCANic movement and expand Girls Auto Clinic Repair Center locations across the country! They are asking for the public’s help to get the news out there, and to support her Girls Auto Clinic. So check out her pre-launch page and keep in touch for her exciting news to come. Jump on the bandwagon and be a part of this exciting movement around girls and their cars! 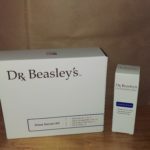 We received a sample of the Dr. Beasley’s Glass Serum Kit, complete with a 1 oz. Glass Serum bottle, 2 oz Glass Coating Prep, 1 Foam Block Applicator and 2 Suede Cloths. They also threw in a 1 bottle of AdvanceCoat: Glass. As Dr. Beasley’s president states, “the proof is in the results.” We found it to be somewhat superior to other products on the market; namely, RainX, and easy to use. The packaging on this new high-tech formulation is handsome and speaks well of the product. You’re not using any low-end ingredients. Indorsed by professionals, automotive manufacturers and enthusiasts alike, Dr. Beasley’s has a popular line of products including a matte paint car line, wheel care, polishes, and ceramic coatings. The Dr.’s products stand out and serve the modern automobiles’ needs well. When I think of the products we used in the past, I shutter at their possible side effects; of which I probably never even considered. Dr. Beasleys Car Care Products, based in Chicago, is new to this automotive writer. We waited for some much-needed rain here in Indy to ‘test drive’ the nano coating serum recently. As the label tells the buyer, Dr. Beasley’s products are handcrafted with over 30 years of detailing knowledge and passion. Easy to apply and with quick results, we found that the rain beaded right off the windshield. We haven’t applied the Serum to side windows yet, but will give that a try, also. A big part of president Jim Lafeber’s motivation to create the Dr. Beasley’s line was his dissatisfaction with how previous products he was using at his Chicago detailing business, Simon’s Shine Shop, were affecting his customer’s vehicles’ health. Jim utilized his chemistry background to formulate detailing solutions of his own. He took in-house products to market under the Dr. Beasley’s name, gaining notability for their matte paint car line. They also formulate, manufacture and package the car care products within their Chicago, IL facility. The “proof is in the results,” says Mr. Lafeber. “Our formulas are crafted with pharmaceutical grade ingredients.” Working to continually enhance their products, Dr. Beasley’s promises ‘high-quality” results.The Glass Serum Kit comes with instructions. (See for yourself at www.drbeasleys.com. Read about their products and order some for yourself). Your car will love you for it! Dr. Beasley’s won us over, not only after first use, but upon learning that Jim named his car care line after his Alaskan Malamute, Beasley. Applying the Glass Serum to all three cars, we promptly tossed our other inferior products in the garbage. I also applied it to windshield of my brother-in-law’s 2010 Kia Soul, after a three-hour detailing project. He’ll have to convice himself it’s really raining the next time he drives when it’s wet!! Try Dr. Beasley’s. We think you’ll agree. Hey, Jim, how about a picture of Beasley (the Malamute) on your box? Mr. Tito’s “dog” vodka isn’t the only star out there! Don’t be unprepared when it comes to caring for your pet’s safety during inclement weather. Think about and plan, a strategy for when an emergency situation strikes. All of us should have a preparedness plan in place should tornadoes, fires, violent storms or floods happen. It would seem that in the last several years, the weather conditions have clearly worsened, making it necessary to have a plan not only for the safety of our family, but for our pets, as well. Think about how you will move your pet(s) in an emergency situation. We’ve all seen the news during horrendous conditions, such as wild fires or hurricanes like Katrina and Harvey. Also handy is a large blanket or thick quilt to help protect you and your pets from dangerous flying glass or other debris in a storm. Learn how to turn off the gas and electricity in your home and be sure to include any needed tools in your kit. A flashlight, cell phone and charger, and weather radio are also musts. Another item that may save lives is a copy of the Pet First Aid book, available through the Red Cross. Taking a class in first aid/CPR for animals might also be a good idea. Our pets should wear a collar at all times, complete with the owner’s name and cell phone number. This simple gesture can dramatically increase the chances of you and your pet being reunited should you be separated. Microchipping, which most dogs and cats receive today from their vet, is also something to seriously consider. Perhaps keeping a copy of your pet’s vaccination, and of your driver’s license can also be helpful. As with all storms, choosing a safe place in your home is necessary; even practicing a drill helps us be as prepared as possible. Go to a basement, crawl space, area under a stairway, or interior room without windows. As soon as the sirens start, go to your designated spot. Take all warnings seriously. Such disasters as mudslides, earthquakes, floods move quickly and often don’t allow time for people and animals to get out of the affected area. Plan for all possible emergencies, from fires in your own home, to natural disasters. Does the fire department know that you have animals in your home? I have a fire safety sticker notice in the front window of my home to alert police and fire that animals live here. With good reason, pets are not allowed at disaster relief shelters. However, many states are working to provide shelters for pets and/or working with shelters in other states to accommodate separated pets. 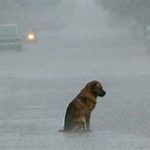 After a disaster, be patient with your pets, try to get them back into their normal routine. Be ready and alert to behavior changes caused by the stress of the event. If there seem to be any health problems, consult your vet. When storms strike, you may not be able to get home immediately. Therefore, it’s good to have a backup plan or person who can reach them. Make sure your backup person or neighbor has a list of your pet’s feeding and maintenance schedule and habits. If you utilize a pet service, determine whether they have any kind of available help during emergency situations. Contact the Federal Emergency Management Agency (FEMA), the Red Cross for more detailed emergency information. Start getting ready now! In case you’re able to pick and choose where you’ll drive this summer, the personal-finance website WalletHub provides their report on 2018’s Best and Worst Cities to Drive in. 2018’s Best & Worst Cities to Drive in. •	(four, which is 25.5 times fewer than in Los Angeles, the city where residents spend the most at 102). •	Gilbert, Arizona, boasts the fewest car thefts (per 1,000 residents), (0.49, which is 33.1 times fewer than in Oakland, California, the city with the most at 16.23). •	Oklahoma City has the lowest average gas price, $2.58 per gallon, (which is 1.5 times lower than in San Francisco, the city with the highest at $3.85 per gallon). •	Riverside, California, has the lowest average parking rate, ($1.43 per two hours, which is 19.2 times lower than in Buffalo, New York, the city with the highest at $27.44 per two hours).